I will make this short and sweet! Emily's scans came back great. We never receive good news and today we did. We needed this news because we worried so much! 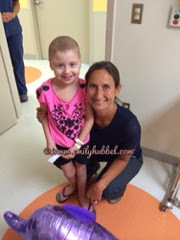 Emily's scans came back as stable with decreased disease and some spots even gone. That is right...great news. They were not worried about the tummy pains or dizziness because they didn't see anything and scans do not show progression. All the thoughts you guys put out for Emily proved to show all the love she has and she is one strong girl and she has her mom and dad to back her and fight with her. Thank you for all the love you send and all the thoughts you send because each one means so much. Dr Sholler looked at us and said "whatever your doing keep doing it!" Now we ask for you all to keep Brooke Hester in your thoughts because they didn't receive good news today!!! Praying for Brooke and asking God to intervene and heal her.